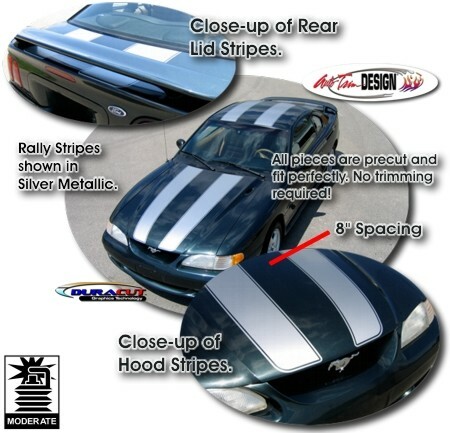 "Trick Out" your '94-'98 Ford Mustang with this six (6) piece Hood, Roof and Rear Deck Lid Rally Stripe Graphics kit. Stripe width is approximately 9.75" (24.77cm). These graphics are all very easy to install and include general online application and care instructions. Note: Trimmable two (2) piece Spoiler Kit (ATD-FRDMSTNGGRPH44) includes two (2) 9.75" x 16" (24.77cm x 40.64cm) pieces (with pinstripes) that can be hand trimmed for custom spoiler applications.